Cab users in the city are having a hard time as the indefinite strike called by drivers of cab aggregators, Uber and Ola, entered the fourth day on Saturday. BENGALURU: Cab users in the city are having a hard time as the indefinite strike called by drivers of cab aggregators, Uber and Ola, entered the fourth day on Saturday. With the protesting drivers refusing to budge from their stand, the strike is likely to continue for another few days. 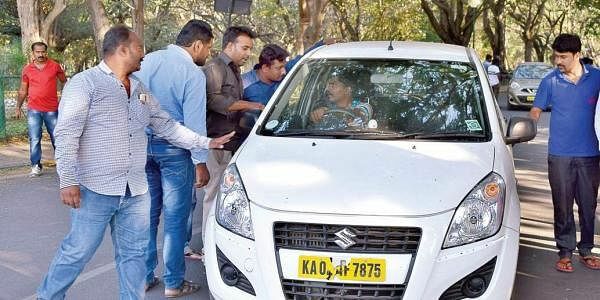 Tanveer Pasha, a member of Ola and Uber’s drivers union, claimed that more than 90 per cent of the cabs remained off the road. “We have decided to continue the strike as nobody has come forward to resolve the issues. Both government and app-based cab aggregators are turning a blind eye to our problems,” he added. The drivers have been protesting against reduced incentives, long working hours and imposition of fines. However, the state government and app-based aggregators are unlikely to interfere in the issue as they have decided to wait and watch till the strike loses steam. He said many cab operators, including Meru, Mega and Karnataka State Tourism Development Corporation (KSTDC), are plying in the city.